Yes, I’ve actually found something else I like wearing on my face other than Kryolan Ultra Fluid foundation! I was out and about a while ago and the need for a tinted moisturiser suddenly struck me. The weather is being a complete tease round here, the odd day here and there is full of sunshine and temperatures are higher than 3 degrees most of the day… it’s not much, but that means Spring is on the way! I just wanted something a little lighter on the face, so I picked this up from Topshop on a whim. I couldn’t recall ever seeing any blog posts about it before, but thought I’d give it a go. 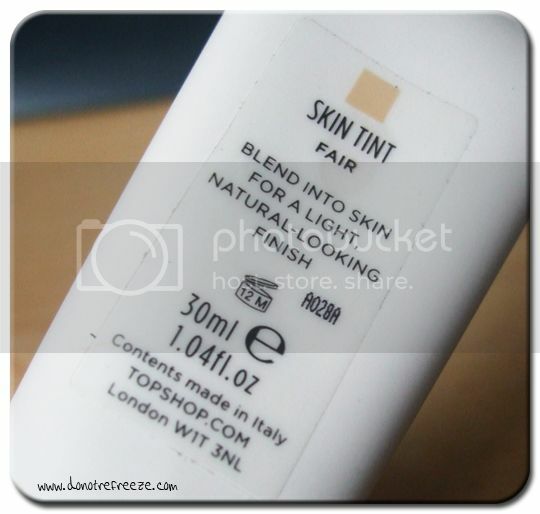 It doesn’t actually say ‘tinted moisturiser’ anywhere on the packaging, and neither does it say ‘foundation’ – but judging by the name Skin Tint you’d just assume tinted moisturiser. I think the coverage is hovering somewhere between the two. I buff this into the skin with an ELF Studio powder brush, and since I’m pretty oily I use it over a primer too. It doesn’t cover my (multitude of) imperfections fully, but I actually kinda like that. It’s very natural looking, but just evens the skintone. I think it would be really good for dry skins, but oily skins will have no trouble with it over a primer. 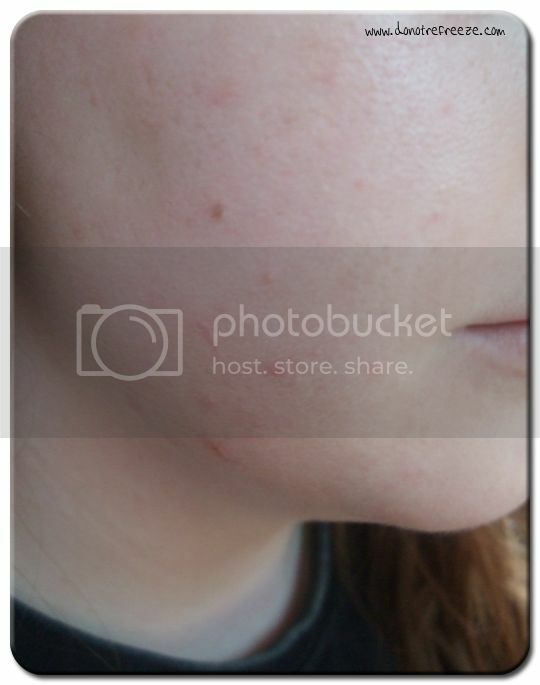 Now here’s the obligatory before and after… I know you hate this part, I hate it too but I am compelled to do it when I review base products – I have AWFUL skin so it’s a good benchmark for coverage. Be brave! Like I said, I actually like that this doesn’t erase my imperfect skin. 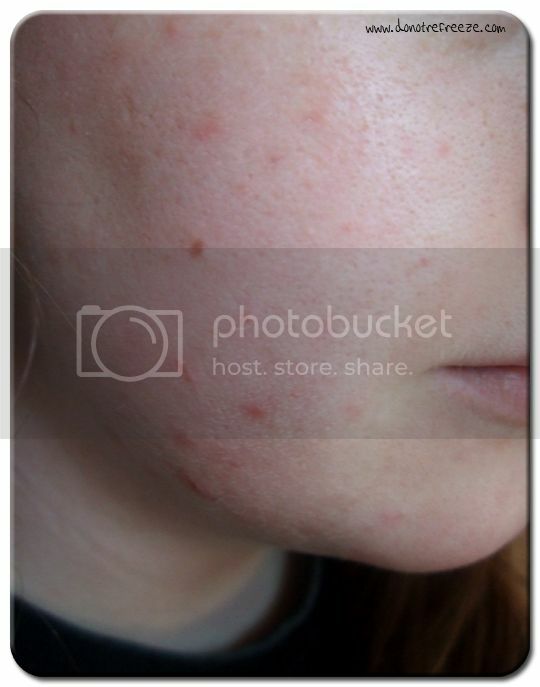 It just gets rid of all the angry redness around my blemishes and evens the blotchy-ness of my skin in general. The colour is a fairly good match for my skin. It looks a little too dark when you squeeze it out (I should mention that it’s actually a pump and not a squeeze tube, which I favour) but it blends right in with the skin. Topshop could definitely benefit from the addition of a few more shades though. There’s currently only 4 (Fair, Light, Medium and Dark). It’d also score extra points if it contained SPF. Overall if you’re after something much lighter on your skin for the impending Spring and Summer, this is at least worth a try. I really like it! It may well be coming to Florida with me in the summer. 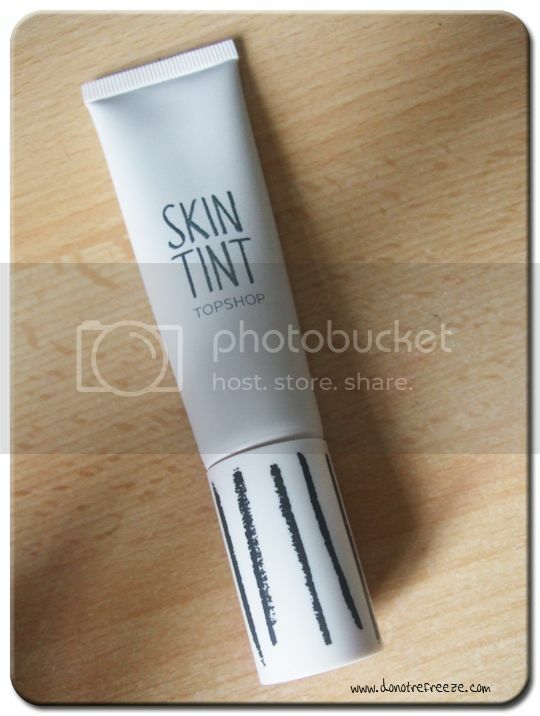 Topshop Skin Tint (£10) is available in Topshop stores and online. Have you tried this? Are you interested in doing so, or do you have any recommendations for great tinted moisturisers? I’ve never used a tinted moisturiser before, but I’m willing to give it a go. We’re going to london in the first week of April and I’m surely going to buy one. I’m not sure wich one to choose though. The london Lipgloss talked about the tinted moisturiser of Witch, do you know if that is any good? Been meaning to try this. I love tinted moisturiser all year round so this coverage would suit me great. That is really good coverage for a TM and doesn’t give the awful orange cast to pale skin other brands do. it would be ahuge leap of faith for me to ditch the foundation, i feel so uggo without it, but i reckon id go for a topshop one…of all the makeup and nail polishes ive tried of theirs, ive like them all. i’ve never tried topshop makeup but have had plans to for a while! my skin is quite oily so i think this would be good for me in summer!